Mini Mosaics are made by hand cutting and setting thin strands of colored glass into a bezel. The segments are set on their sides. The piece is then grouted and sealed. Custom design is taking a concept to a finished piece. Fabricated jewelry is made by manipulating the metal by methods such as cutting, shaping, assembling, soldering, etc. After the design was sketched out and the mechanics of the piece were considered, I began carving the wax. The jewelers wax I use is very hard and smooth to carve. It almost feels like a cross between wax and plastic. I use exacto knives, Kate Wolf wax carving tools, files, burs, dental tools, and emery paper in order to achieve the carving. With some pieces, I follow the exact drawing and other work takes on a life of their own. 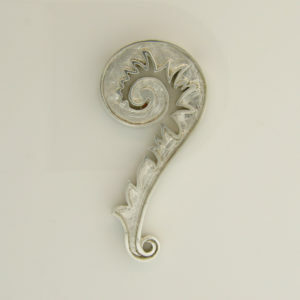 The Fern Slide pictured above is designed to accommodate a chain that will slide in on the back of the piece. There’s a lip around the edge creating a hollow where I will be setting the Micro Mosaic. 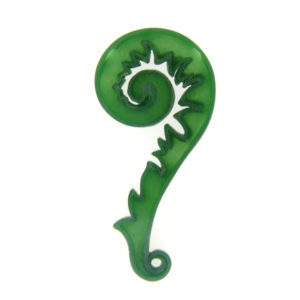 Raw casting of the Fern pendant before finishing and setting micro mosaic. The wax carving is then placed in a metal cylinder which is filled with a type of fine plaster called investment. Once the investment has dried, the cylinder is placed into a kiln and the wax is burned out leaving an impression in the investment. The impression replicates the wax carving that was burned out and that’s where the term “lost wax casting” comes from, because the wax is actually burned out and lost. Molten metal is then forced into the cavity. Once cooled, the metal is filed, sanded and polished. The photo you see is the raw casting before being polished. 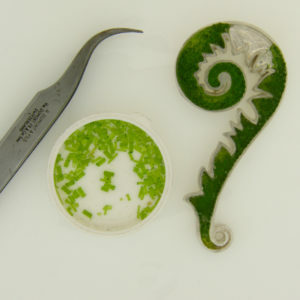 The photo shows the fern pendant during the setting process. The sterling silver casting is now sanded and polished and it’s ready for the Micro Mosaic process.Strands of colored glass are cut into small segments. Each segment is meticulously set into the recessed bezel using fine tweezers and epoxy. The bezel is now filled and the epoxy has cured. The colored glass is ground flat then polished on a lapidary wheel. Micro Mosaics are made by hand cutting and setting thin strands of colored glass into a bezel. Once filled, the piece is then ground and polished to a smooth surface.